It is now 1:30am and I still can't sleep again so let us make my time a bit useful. Inspired by what Bernard Bout has shown here, I decided to see earlier today how it can be done on an excel instance. Please read it (click on here word above) before proceeding below as I will try to break things apart for our better understanding. Bernard has given us a great starting point because the basic ingredients are already there. And I agree and actually appreciated that Bernard has not shown all the tricks for if he has, I won't try to maybe understand some of those and simply will use the trick blindly; and I won't get a better understanding of those. Nope. He has given it to us as that is one of the simplest command to open up a 3rd party app. But there are alternatives to it like RUN, ShellExecute(), scripting and some more. The main goal and the first step, I've come to realize, is to open up the file or app in any of the ways possible and since my target here is Excel and I am into automation when it comes to excel, then automation it is. Where nHwnd is the Window handle of the 3rd party app we want. The above is saying, in layman's term, find a newly opened and unsaved notepad instance among the open windows and put a handle onto its window so we can work further on it. That caption is what you will see as caption when you open up a notepad by itself. If VFP won't be able to find the window handle, then nHwnd will return 0. Needless to say, the above works. So far so good! And it does not open properly. I mean it does open but it opens outside of my app on its own. Drat!!! I wasted my time trying to find the right combination on Excel's titlebar internal caption by applying the actual cases of the filename using FSO... still no luck (I realized in the end through repeated testing though that character case like proper, upper and lower do not affect it), jumbling and re-positioning words in caption.... again no luck.... and I was about to give up as I've already wasted almost 2 hours for just that stupid internal caption (hey I was frustrated, LOL!) and is about to shelve the whole project when a thought came by. Heck!!!! I am doing automation so what is keeping me from doing this? And Viola!!!! A very flexible way of ensuring to find the proper caption of an open excel file without minding whether it is on compatibility mode or not or on whatever version of Excel I am using! Great! Of course, said approach is not limited to just excel. On to other parts now. What I've noticed as well is that the trick uses a shape. And when I first read and saw the trick, my presumption is that excel or any 3rd party app magically appears on said shape morphing said shape into those 3rd party app. But since I am now trying to break things apart, I come to realize that with or without that shape, we can open those 3rd party apps inside our app. So what is that shape then for? Said invisible/visible (your choice) shape on form is there for one reason only. That is not to show the 3rd party app but to serve as an easy way to set the coordinates of those 3rd party app from within our form, as it is easier to resize a shape and instruct said 3rd party app to "follow" the coordinates of that shape than do it on codes on a repeated trial and error way. Create a shape, size and position it in the form to your liking, hide it if you want, and instruct the 3rd party app to follow its coordinates. Very ingenious by those who originally thought of the idea. 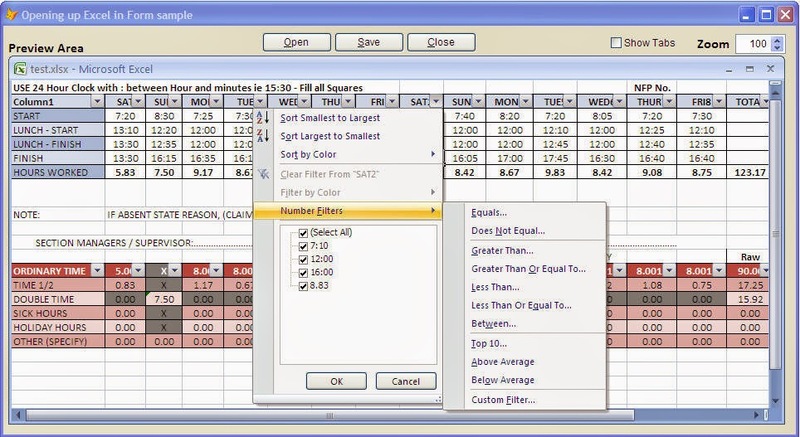 Excel not clickable, not editable and a lot of nuts! But once you've made Excel visible, then the whole excel file will be inside our form with all its glory like ribbon, formula bar, worksheet tabs, etc. Well some of you guys may want it that way but I don't. So I have to hide those. Just check the codes later on how to do those. Not surprisingly, resizing the form will leave the 3rd party app on its original coordinates. But this is easy, check the codes. Just check the codes.... I am starting to get sleepy, finally. Even playing with SetWindowPos' uFlags did not gave me the expected results. I was able to utilize a good flag though when we are trying to open up a new excel file so excel will not slowly destroy its objects in front of our eyes when we close it. I will continue playing with this and if I find ways, I will update this. Or since the plan as usual is to post this inside foxite forum which is among the friendliest developers' forums I have seen, hopefully someone who may have toyed with this before ahead of me (sorry I am always late) can share to us how to work around those issues; then I will edit this post to include their codes as well as the contributor. Found the missing link, LOL! The trick on hiding excel's title bar is instead of looking for a hidden properties of excel to hide those is to manipulate it directly using these two WinAPIs, i.e., GetWindowLong and SetWindowLong. Those are possible because we already have a handle on its window. Check on the codes below how it is done! FontName = 'Calibri', FontSize = 12, AutoSize = .T. First of all, many Thanks to Bernard Bout whose post serves as my inspiration for this approach. Special thanks to Yousfi Benameur who shared to us as well before the codes to hide the ribbon of Excel on Office 2007. Whenever I am doing this style of write up, I am aiming for readers who are new to these to try to understand the purpose of each steps/objects/codes. What is the purpose of WinExec here, why we need knowing the caption, what is the purpose of the shape on form, etc?. Your precious Experience is lightening path for me and all VFP. Thanks Zia. Whenever I attempt to share something, I also gain new experiences and knowledge. So it is rewarding both for me and I hope my readers. Thanks Jignesh, Always glad to be able to contribute back.